U.S. Secretary of State Mike Pompeo testifies at a hearing of the U.S. House Foreign Affairs Committee on Capitol Hill, May 23, 2018. U.S. Secretary of State Mike Pompeo vowed Wednesday the Trump administration would take "appropriate countermeasures" against any Russian interference in the November congressional elections, but acknowledged officials have yet to figure out what "effective deterrence" might work. Pompeo told the House Foreign Affairs Committee that the government would not tolerate Russian meddling in the campaign leading up to the November 6 vote, when all 435 seats in the House of Representatives and a third of the Senate are being contested. The U.S. intelligence community concluded that Moscow conducted a clandestine campaign to help President Donald Trump win the 2016 election, which in turn led to special counsel Robert Mueller's yearlong criminal investigation. Pompeo, the top U.S. diplomat, said U.S. officials expect "continued efforts" by Russia to interfere with the congressional elections, now in the early stages in many U.S. states six months ahead of the voting. He said there is much work ahead to mitigate any Russian interference. Trump has often belittled claims that his campaign colluded with Russian interests, regularly branding Mueller's probe as a "witch hunt," as he did again Wednesday. 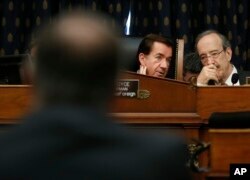 Chairman Rep. Ed Royce, R-Calif., center, talks with Ranking Member Rep. Eliot Engel, D-NY., right, as they listen to testimony by Secretary of State Mike Pompeo, left, at the House Foreign Affairs Committee hearing on Capitol Hill in Washington, May 23, 2018. Congressman Eliot Engel, the top-ranking Democrat on the committee, contended that the Trump administration "is giving Russia a pass" because Russian President Vladimir Putin "supported President Trump over Hillary Clinton" in the 2016 presidential election. "If we allow foreign interference in our elections so long as it supports our political objectives," Engel said, "then we've put party before country and put our democracy in crisis." In his testimony, Pompeo touched on an array of foreign affairs issues. He said the planned June 12 summit between Trump and North Korean leader Kim Jong Un is still set, but stressed that Washington is prepared to walk away from the negotiations if "the right deal is not on the table." He said that ultimately whether it takes place is up to Kim, but that the United States is "very hopeful" that it does. "We're optimistic that we can achieve an outcome that would be great for the world," he said. But Pompeo, who has twice met with Kim in Pyongyang in preparation for the Singapore summit, said, "Our posture will not change until we see credible steps taken toward the complete, verifiable denuclearization of the Korean peninsula." "A bad deal is not an option," he said. "The American people are counting on us to get this right." He said the United States has not made any concessions to North Korea before the talks. 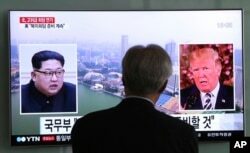 FILE - A man watches a TV screen showing file footage of U.S. President Donald Trump, right, and North Korean leader Kim Jong Un during a news program at the Seoul Railway Station in Seoul, South Korea, May 16, 2018. On Tuesday, Trump said the planned summit in Singapore might not take place as scheduled. Pompeo said the United States is looking to meet with allies, including European officials, in early to mid-June on the next steps in dealing with Iran's nuclear weapons development, after Trump earlier this month withdrew the United States from the 2015 international accord that restrained Tehran's nuclear program in exchange for lifting economic sanctions that had hobbled the Iranian economy. The United States says it plans in the coming months to reimpose sanctions against Iran in hopes of pushing Tehran to the bargaining table for new negotiations over its ballistic missile tests and military advances in the Middle East. But the five other signatories to the international pact — Britain, France, Germany, China and Russia — all have said they support the existing nuclear deal with Iran. "We seek to work with as many partners, friends and allies as possible to achieve the common objective of stopping all of Iran's nuclear and non-nuclear threats," Pompeo said.